Miss Harper Goes to School - the abused dog has visited a local middle school to teach kids about animal abuse. Jericho, NY - March 23rd, 2014 - Jericho Middle School's Community Service Learning classes and Student Council invited Miss Harper to visit students at the middle school library. Miss Harper is still currently convalescing at My Pet's Vet, a veterinary hospital in Huntington. She was abused and horribly disfigured after someone cut off her outer ears and part of her hind leg. Miss Harper is receiving excellent medical care at the hospital and will soon be fitted with a prosthetic leg. Miss Harper was accompanied by Mr. Bob Sowers, of the Nassau County Society for the Prevention of Cruelty to Animals, and Ms. Donna Kramer from My Pet's Vet. 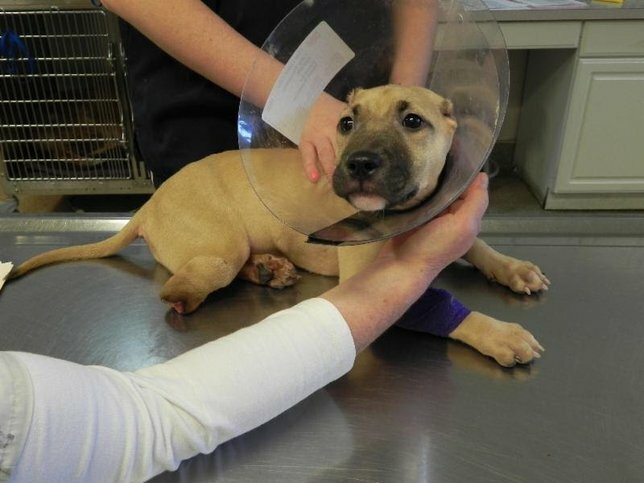 Community Service and Student Council have begun a fundraising effort specifically for Miss Harper's rehabilitation expenses, as well as a general drive for the Nassau County SPCA. Her visit marked the beginning of their effort. The Nassau County SPCA would like to thank the Jericho Middle School's Community Service Learning classes and Student Council for their interest and caring for Miss Harper. email crueltystoppers@ncspca.us or fill out the online form. Subject: LongIsland.com - Your Name sent you Article details of "Miss Harper Teaching Children About Animal Cruelty"